With less than a month before a March 1 deadline for either a deal or an increase in U.S. tariffs, hardliners inside and outside the administration fret Trump is being outplayed by Chinese President Xi Jinping and seduced by what they see as empty promises. After Trump hosted Chinese Vice Premier Liu He at the White House last week, one administration official privately likened the direction of negotiations to the president’s caving to Democrats in the shutdown battle over funding for a border wall. Another person close to the talks said Trump appeared determined to turn a pile of crumbs offered by China into what at best might turn out to be a slice of bread. Trump is likely to hail his own trade fight with China in his State of the Union address on Tuesday. But the concerns are driven by what some aides and others see as the president’s appetite to strike a deal to calm financial markets. They are also -- as seems to almost always be the case with the China trade conflict -- embodied by soybeans. During his meeting with Liu, Trump hailed a Chinese offer to buy five million tons of soybeans that was the most tangible outcome of two days of talks. “That’s going to make our farmers very happy. That’s a lot of soybeans,’’ Trump said. Only what Trump saw as an extraordinary mountain of beans was little more than what once would have been an ordinary foothill. 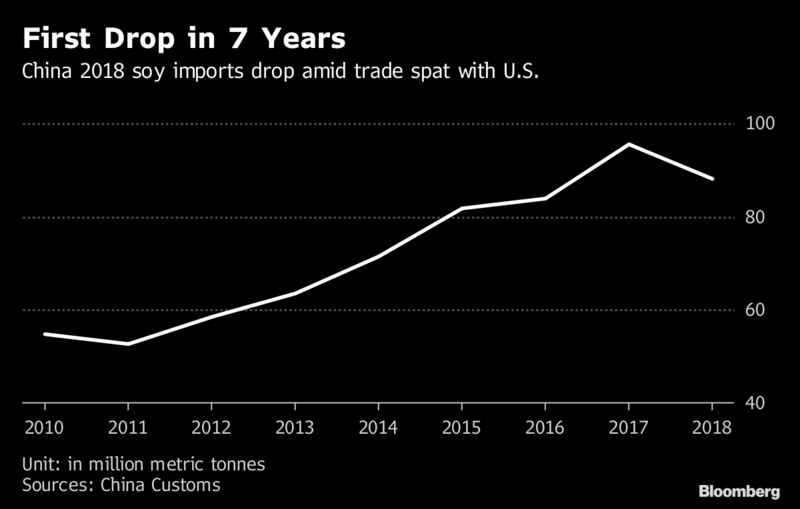 It also did nothing to remove the underlying cause -- Chinese retaliatory tariffs -- of last year’s collapse in U.S. soy exports to China. In a normal year China buys about 35 million tons of soybeans from the U.S. So far this year China’s purchases have been 20 per cent of what they were in the last marketing year, according to John Newton, chief economist at the American Farm Bureau. So even with the new purchases a vast gap remains, as does plenty of uncertainty for farmers going into a planting season with silos around the country holding a record stockpile. The Chinese soybean offer was reserved for the meeting with Trump. U.S. Trade Representative Robert Lighthizer told reporters he learned about it only shortly before the meeting with Liu and U.S. officials were initially confused about how large the offer was. The fact it contained no commitment to drop China’s retaliatory tariffs left one person close to the talks grumbling the offer embodied how China is maintaining its leverage over Trump. Another participant called the soybean purchase the only meaningful agriculture commitment China made during last week’s negotiations. The oilseed saga is also an example of why some believe Trump’s transactional approach to trade talks is unwinding years of careful U.S. diplomacy. Trump has repeatedly denigrated past presidents’ efforts to deal with China. He last week vowed to negotiate a “comprehensive’’ trade deal that would include meaningful changes in economic policy and bring an end to the theft of U.S. intellectual property. Fully-fledged trade pacts are detailed and binding treaties that can run thousands of pages. Lighthizer has said any China deal would likely take the form of little more than a memorandum of understanding between Trump and Xi. One administration official said that approach was emblematic of Trump’s pragmatic take on trade and the disdain Lighthizer and others in the administration share for traditional deals. What comes of any deal will depend on the political will of future presidents to use the same tariffs Trump has employed to enforce it, the official said. Whatever form it takes many experts remain skeptical any pact will alter the arc of history or substantially reconfigure the relationship of the world’s two largest economies. “China is still going to emerge as the largest economy in the world probably within 10 years,’’ said David Dollar, a former U.S. Treasury representative in Beijing now at the Brookings Institution. Other China experts argue it’s worth reserving judgment, particularly ahead of the next leg of negotiations due to take place in Beijing in mid-February.